Tucked between news of budget meetings and beauty pageant winners published in The Dickenson Star’s 2017 “Year in Review” is a grim statistic: Dickenson County was first in the state and sixth in the nation in opioid overdose deaths per capita. In Dickenson County, in the coalfields of Southwest Virginia bordering Kentucky, residents have been dying of prescription opioid overdoses in recent years at a rate of about 40 per 100,000 people – more than seven times the statewide rate. The newspaper’s annual review is cited in the introduction of a lawsuit filed by Dickenson County against 30 pharmaceutical manufacturers, distributors and providers including Purdue Pharma, Abbott Laboratories and CVS Health Co. Represented by the Sanford Heisler Sharp law firm and the Cicala Law Firm, Dickenson is suing for $30 million in damages. The suit says the defendants deliberately increased the flow of opioids into the county, state and country. The case is one of the latest examples of communities across the nation suing pharmaceutical companies and associated businesses and alleging that they had a role in creating the epidemic. In Virginia, the city of Alexandria is suing for $100 million while in neighboring Maryland, Montgomery and Prince George counties have also taken legal action. Joanne Cicala, founder of the Cicala Law Firm, which has offices in Texas and New York, says those who are responsible for and profited from the epidemic must be held accountable for its costs. In more than 100 pages, the lawsuit tells the story of how Dickenson County – with a population of fewer than 16,000 residents spread out over 334 square miles – was drawn into a prescription opioid overdose epidemic that claimed more than 500 lives across the state in 2017. Did manufacturers ‘push opioid as safe, effective drugs’? As with any drug that enters the prescription market, the distribution process begins with manufacturers. In the case of the opioid epidemic, one of the manufacturers is Purdue Pharma, a company known for its best-selling opioid – OxyContin. In Dickenson County, the lawsuit claims, Purdue Pharma and other defendants recognized “the enormous financial possibilities associated with expanding the opioid market.” So they “rolled out a massive and concerted campaign to misrepresent the addictive qualities of their product, and to push opioids as safe, effective drugs for the treatment of chronic pain,” the suit alleges. According to the lawsuit, the drug manufacturers took part in a “campaign of deception” rooted in a since-disavowed study by Dr. Russell Portenoy published in the medical journal Pain in 1986. In the study, Portenoy claimed that opioids could be used for long periods of time “without any risk of addiction” to treat chronic pain unrelated to cancer. The study said patients in pain would not become addicted to opioids because their pain drowned out the euphoria associated with the drugs. Within a decade, Portenoy was financed by at least a dozen pharmaceutical companies, most of which produced prescription opioids. The lawsuit argues that Portenoy’s study – paired with the practice of spending millions of dollars on promotional activities that understated the risks of opioids – not only legitimized but normalized the prescribing of opioids in Dickenson and across the country. The drug companies’ sales representatives marketed directly to physicians, ensuring that doctors would be advocates for certain drugs, the lawsuit said. As a result, it contended, the pharmaceutical manufacturers were able to insert their products directly into specific markets. In 2014 alone, the manufacturing defendants named in the Dickenson lawsuit spent more than $168 million on pursuing branded opioid sales contracts with doctors, the lawsuit said. Twenty-six years after publishing his study justifying the prescription of opioids, Portenoy acknowledged that he erred in understating the risks of addiction associated with such drugs. As explained in the lawsuit, pharmacy benefit managers, or PBMs, are the middleman between the manufacturers and the marketplace; they influence which drugs are used most frequently, set prices for pharmacies and control what drugs are covered by health insurance providers. PBMs include Caremark, Express Scripts and OptumRX – all named as defendants in the lawsuit. These companies serve as gatekeepers through controlling lists known as “drug formularies” that identify prescription drugs with the greatest overall value. PBMs and pharmaceutical companies negotiate financial arrangements, including rebates for preferred placement on drug formularies, the lawsuit said. It said manufacturers compete for spots on the list in order to ensure greater utilization of the drugs they make. Not only do PBMs have the power to make opioids cheaper – they can make less addictive medications harder to acquire, the lawsuit said. For example, it said, United Healthcare places morphine on its lowest-cost coverage tier with no prior permission required; in contrast, Lyrica, a non-opioid drug prescribed for nerve pain, is on the most expensive tier, requiring patients to try other drugs first. The impact of the opioid epidemic in Dickenson County is multifaceted. While the county’s overdose rates are the most conspicuous consequence of the epidemic, the increased flow of opioids into the region has had a ripple effect on the county’s economy, health care system and workforce. In 2017, the U.S. Centers for Disease Control and Prevention identified Dickenson County as one of eight Virginia counties that are vulnerable to the rapid dissemination of HIV and hepatitis C infections among people who inject drugs. L. Christopher Plein, a professor of public administration at West Virginia University, said the opioid epidemic is a public health crisis, but it also has far-reaching economic consequences. The lawsuit argues that the opioid epidemic has significantly and negatively impacted nearly every aspect of the county’s $26 million budget and the public services it provides, including health care, emergency medical services, social services, law enforcement and drug prevention, education and treatment. Dickenson County has had to buy opioid antagonists such as naloxone – medications that can reverse drug overdoses. Moreover, the county has lost tax revenues because of the opioid crisis, the lawsuit said. For example, the drug epidemic has affected the job market and workforce in Dickenson County. The Virginia Employment Commission reported last week that Dickenson’s unemployment rate in March was 6.6 percent – double the statewide rate. Dickenson had the fifth-highest jobless rate among Virginia’s 133 counties and cities. Del. Todd Pillion, R-Abingdon, says these consequences can no longer be ignored. In response to the growing number of lawsuits brought against the company, Purdue Pharma announced in February that it would stop marketing opioid drugs to doctors. “We have restructured and significantly reduced our commercial operation and will no longer be promoting opioids to prescribers,” the company said in a written statement. Purdue officials said that they cut their sales staff in half in the week following the announcement and that the remaining staff would pivot to focus on other products. Kevin Sharp, lead counsel for Dickenson County’s lawsuit, called the announcement a step in the right direction. But he said the damage already inflicted demands a more comprehensive response. “We are deeply troubled by the prescription and illicit opioid abuse crisis, and we are dedicated to being part of the solution. As a company grounded in science, we must balance patient access to FDA-approved medicines with collaborative efforts to solve this public health challenge. In April 2017, the Virginia Department of Medical Assistance Services launched the Addiction Recovery and Treatment Services program to help increase access to treatment for Virginians battling opioid addiction. The ARTS program was established primarily to help ease the burden on hospital emergency departments in treating patients with opioid-related issues, particularly in rural areas like Dickenson County. The program expands treatment to Medicaid recipients by combining traditional medicine with counseling and other support systems. It also offers training and financial incentives to providers to encourage participation among outpatient treatment centers, doctors and hospitals. According to an evaluation by Virginia Commonwealth University’s Department of Health Behavior and Policy, the program has increased the number of Medicaid recipients receiving treatment for opioid addiction by more than 50 percent, and the number of opioid-related emergency hospital visits by Medicaid recipients declined by nearly one third. As a health care professional, state Del. Todd Pillion of Abingdon has a special perspective on the opioid epidemic that has ravaged the localities he represents in Virginia’s General Assembly. Pillion, a pediatric dentist, has successfully sponsored key legislation to address the crisis. He represents the 4th House District, which includes Dickenson County and parts of Wise, Russell and Washington counties. HB 1556 will add the opiate overdose reversal drug naloxone and other Schedule 5 drugs for which a prescription is required to Virginia’s Prescription Monitoring Program. This will allow the Virginia Department of Health to monitor whether prescribers and dispensers are following state regulations and to deter the illegitimate use of prescription drugs. By adding naloxone to the list, officials can track if it is being co-prescribed with opiates in order to prevent fatal overdoses. HB 1157 will require the Department of Health to develop and implement a plan of action for substance-exposed infants in Virginia. The plan must support a “trauma-informed approach” to identifying and treating substance-exposed infants and their caregivers, explore how to improve screening of substance-using pregnant women, and use multidisciplinary approaches to intervention and service delivery during the prenatal period and following birth. HB 1173. Under current law, physicians who prescribe opioids are not required to request information from Virginia’s Prescription Monitoring Program as long as the prescription does not exceed 14 days and is treatment for a surgical or invasive procedure. HB 1173 eliminates the exception for prescriptions related to surgical and invasive procedures to bypass the PMP. The three new laws will take effect July 1. RICHMOND – In Fall 2010, Virginia Commonwealth University increased annual tuition by almost 24 percent, tacking $1,700 on to each in-state student’s bill in one fell swoop. While that jump may seem like an outlier, tuition increases have been the norm at the state’s institutions of higher education during the past decade. Public colleges and universities in Virginia have increased tuition by an average of 82 percent over the past 10 years. While various factors, including state budget cuts, contribute to tuition increases, these decisions take place at board meetings where it can be difficult for students and members of the public to make their voices heard. Even so, a bill by Del. Jason Miyares, R-Virginia Beach, to mandate public input on proposed tuition increases – as required in 10 other states – appears to be dead for this session. HB 1473, which sought to require university trustees to hold a public comment period, unanimously passed the House of Delegates on Feb. 6. After the Senate Education and Health Committee voted 14-1 in favor of the bill, it then was sent to the Senate Finance Committee – which supporters saw as a bad omen. They were right. On Tuesday, the Finance Committee killed the bill on a 6-4 vote. The next day, the committee reconsidered the matter – but the bill again was “passed by indefinitely,” 7-6. The committee heard testimony from representatives of the University of Virginia and the College of William & Mary, as well as from representatives of Partners for College Affordability and Public Trust, a progressive advocacy agency for college affordability. While Toscano argued that Miyares’ bill is important for transparency, Betsey Daley, U.Va.’s associate vice president for state governmental relations, said the measure was unnecessary, as emails from board members, the president and other officials are already available online. “One public hearing is not a substitute for year-round input we have at U.Va.,” Daley said. According to the State Council of Higher Education of Virginia, there is an inverse relationship between state funding and the rate at which tuition increases at public colleges and universities. When the state provides support for these institutions, the colleges themselves are better able to control fluctuating tuition costs. In 2010, for example, VCU felt the impact of a $40 million budget cut, the same year tuition increased by 23 percent. Virginia has established a cost-share goal of the state funding 67 percent of university operations and students fronting the remaining 33 percent; however, the state is expected to pay only 47 percent in 2018. Students will carry 53 percent, a record high. According to SCHEV, it would take more than $660 million in additional state revenue to reach the 67/33 cost-share goal. But doing so could lower tuition costs by $2,700. In the meantime, Virginia students owe more than $30 billion in student loan debt. SB 394, a bill that would create a state ombudsman for student loan issues, has unanimously passed in the Senate and appears to be on its way for House approval. RICHMOND – Virginia legislators are seeking to mitigate the personal and economic consequences of their constituents’ student loan debt by creating a state-level ombudsman to troubleshoot problems and educate borrowers regarding college loans. In 2017, more than 1 million Virginians owed more than $30 billion in student loan debt, state officials say. Nationally, student loan debt is more than $1.3 trillion and climbing. “Virginians owe more on student loans than we do on credit cards or car loans, but only student loans lack consumer protections,” said Anna Scholl, executive director of Progress Virginia, a liberal advocacy group. This week, the Senate and House each passed bills to create the Office of the Qualified Education Loan Ombudsman and establish a Borrower’s Bill of Rights. SB 394 passed the Senate unanimously on Monday; HB 1138 cleared the House, 94-5, on Tuesday. Supporters say the ombudsman’s office would help college students secure loans and understand how to pay them off. They said the office also would establish a culture of transparency, fairness and open communication between loan providers and borrowers. Besides reviewing and resolving borrower complaints, the ombudsman would educate loan borrowers about their rights and responsibilities and about potential problems such as late payments. By December 2019, the ombudsman would develop a course for borrowers, half of whom are under 25. “Too many student borrowers sign their names on the dotted line at only 18 or 19 years old without fully comprehending their rights and responsibilities associated with that debt, but also knowing that without those loans they would not be able to earn their degrees,” said Del. Maria “Cia” Price, D-Newport News, who sponsored HB 1138. In addition, the Senate unanimously approved SB 362, which would require companies that handle the billing and other services on student loans to obtain a license from the State Corporation Commission. Virginia is not the first jurisdiction to experiment with measures to protect student loan borrowers. Washington, D.C., established a student loan ombudsman and Borrower’s Bill of Rights a year ago. The bipartisan approval of the legislation marks a win for Gov. Ralph Northam, who included the creation of a student loan ombudsman among his top priorities for the 2018 session. Price also sponsored a bill that aimed to create a state agency to help Virginians refinance their student loan debt. HB 615 was killed on a 5-3 party-line vote in a House Appropriations subcommittee. RICHMOND — Efforts to fight what some call “legalized corruption” in the Virginia General Assembly were announced Thursday by the Clean Virginia Project, a new nonpartisan initiative seeking to curb Dominion Energy’s financial influence on Virginia lawmakers. Delegates who sign the pledge would receive an annual political donation of $2,500 while senators would receive $5,000 — a fraction of what they might otherwise receive from Dominion. Donating more than $11 million over the past decade to Democratic and Republican candidates alike, Dominion’s influence on the Virginia’s General Assembly is unparalleled by any other corporations. For comparison, Altria — one of the world’s largest producers and marketers of tobacco and headquartered in Henrico — donated less than $7 million over the same period of time. Legislators from both parties, including Democratic Gov. Ralph Northam and House Speaker M. Kirkland Cox, R-Colonial Heights, received donations from Dominion throughout the 2017 election season. While Northam accepted more than $100,000 in campaign and inaugural donations from the company in 2017 alone, Cox has accepted donations totaling more than $220,000 between 1998 and 2017. Dominion’s funding efforts are primarily derived from the corporation’s political action committee but often come together with donations by corporate executives like Tom Farrell II, the company’s chairman, president and CEO, and Thomas Wohlfarth, the senior vice president of regulatory affairs. Michael Bills, a Charlottesville-based investor and prominent Democratic donor, is the key funder behind the nonpartisan group, which is housed within former Democratic gubernatorial candidate Tom Perriello’s new political action committee, New Virginia Way. The Clean Virginia Project is only one instance of a statewide attitude change toward the relationship between major corporations and lawmakers. It coincides with national efforts to encourage politicians to reject financial support from the energy industry. This pushback has caused tension between Dominion officials and the group, with officials arguing that their company is being unfairly targeted for making campaign donations that are legal. “Isn’t democracy great?" Dominion spokesman David Botkins said in an email to the Richmond Times-Dispatch. "People can do whatever they want to with their money — as long as it’s transparently disclosed on Virginia’s Public Access Project website, which we helped start in 1997 and have supported ever since." But Bills calls the initiative “common sense” that will level the playing field in politics. “Virginians should no longer have to pick up the tab for backroom deals like the one Dominion and its allies are trying to ram through our legislature,” Bills said. The announcement comes in the wake of Senate Bill 966, a quickly moving bill that would repeal a hotly debated 2015 rate freeze and provide Virginia customers with a refund on what Northam has called an “overcharging” for power rates. In addition, SB 966 would require Dominion to reduce power rates by an additional $125 million as well as investmore than $1.1 billion in energy-efficiency projects and energy assistance to low-income communities throughout the next 10 years. As of Tuesday, Activate Virginia reported that 21 Democrats running for Congress this year have signed the pledge. “Everyone will tell you that Dominion’s money doesn’t impact their vote, but given the fact that almost nobody says no to Dominion, I think that’s pretty obvious it has a large aggregate effect,” said freshman Del. Lee Carter, D-Manassas. RICHMOND – A bill nicknamed the “Netflix tax” was unanimously defeated Monday in the House Finance Committee, ending the possibility of taxing streaming services in Virginia in 2019. Introduced by Del. Vivian Watts, D-Fairfax, HB 1051 would have applied the state’s 5 percent communications sales and use tax not just to Netflix but to all online streaming services – among them Hulu, Spotify and HBO Go – that have skyrocketed in popularity, especially among millennials. While the current communications tax applies to cable TV, satellite radio, landlines, cell phones and even pagers, streaming services are not included. Watts said her bill was needed to modernize the state’s communications tax. “Obviously, the way we have continued to communicate has changed,” she said. Watts told the committee that her bill would apply equal taxes to all forms of communication. “The best we can hope for is a fair tax structure,” she said. According to the bill’s impact statement, the tax would generate nearly $8 million in revenue for the state – potentially allowing Virginia to become less dependent on other forms of taxes, like those collected through income and real estate levies. The bill is not the first of its kind: Pennsylvania and Florida have passed laws that tax internet transactions and digital streaming services. But the tax has faced opposition from taxpayers, streaming services and industry trade groups. The Finance Committee voted 22-0 against the bill. Watts voted against her own legislation, acknowledging that while the measure was not ready to be passed, she wanted to spur a larger conversation about Virginia’s tax structure. Republicans said they were opposed taxing the heavily used services. Representatives from T-Mobile, Verizon and Sling TV attended the meeting and spoke against the bill, while the Virginia Municipal League and the Virginia Association of Counties were in favor. Neal Menkes of the Municipal League commented that he had “yet to hear a pager go off,” echoing Watts’ sentiments about the need to modernize tax law around a quickly changing communications landscape. 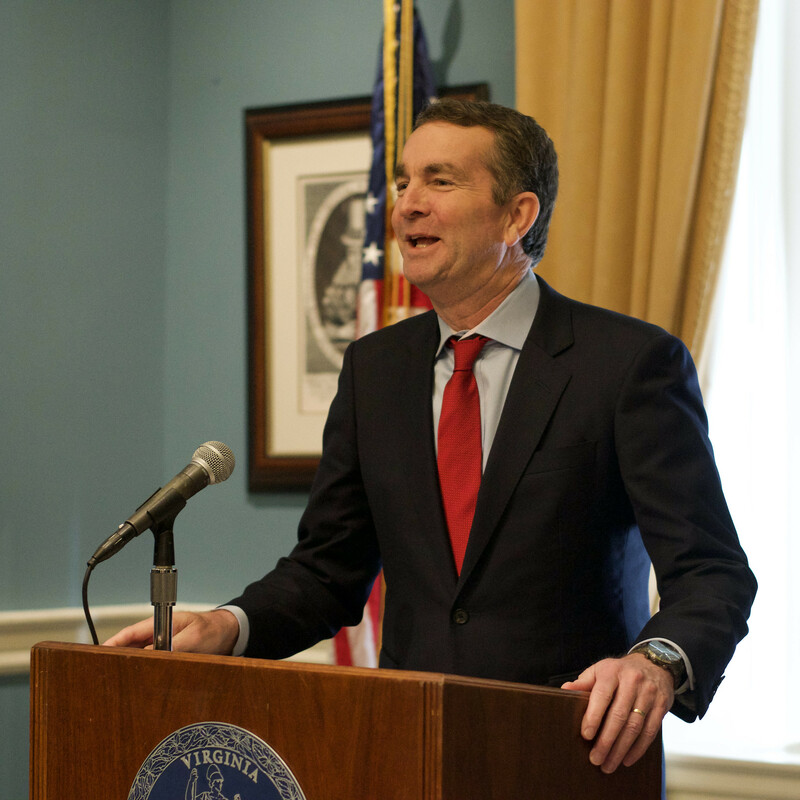 RICHMOND – As a priority for the legislative session that begins Wednesday, Gov. Terry McAuliffe and Gov.-elect Ralph Northam are calling for universal background checks for gun sales. “These measures are crucial for the safety of our communities,” McAuliffe said, citing a 51- percent increase in gun homicides in Virginia over the past five years. Currently, only federally licensed firearms dealers must administer background checks. Under the proposed legislation, the background check requirement would be expanded to all dealers, including gun shows and private sales. The Democrats held a joint press conference Tuesday to outline their priorities for the 2018 session of the General Assembly, in which Republicans have a narrow majority in both chambers. Northam, who will be inaugurated as governor on Saturday, urged lawmakers to approve “no excuse” absentee voting. Under the proposed legislation, any registered voter could cast an absentee ballot, in-person, within 21 days of Election Day. “Why would we make it more difficult for people to vote on Election Day?” McAuliffe asked. He called the proposal non-partisan and said it would simplify the voting process and decrease lines and waiting times on Election Day. Northam and McAuliffe also advocated expanding access to Medicaid for 400,000 Virginians currently without health coverage. The two officials expressed support for language in the 2018-20 budget to provide Medicaid to Virginians who make too much to qualify under the program’s current income limits but can’t afford private health care. Ensure that campaign contribution funds donated to candidates and elected officials cannot be spent for personal use. Raise the threshold for felony larceny from $200 to $1,000. Implement a Borrower’s Bill of Rights and create a state ombudsman for student loans. Have Virginia join the Regional Greenhouse Gas Initiative, a market-based program to reduce carbon emissions. Virginia would be the first Southern state to join RGGI.